For a mobile ad to work, it has to be compelling enough to switch your user’s attention from whatever they’re doing in an app to perform the requested action. Simple and complex at the same time, an ad has to be strong and speak directly to the viewer. With only about a split-second to grab attention, a strong creative strategy is the key to conversion. In app marketing, a creative strategy centres around the creatives used in your campaign and encompasses a number of elements including the message, design (of ads), and content. 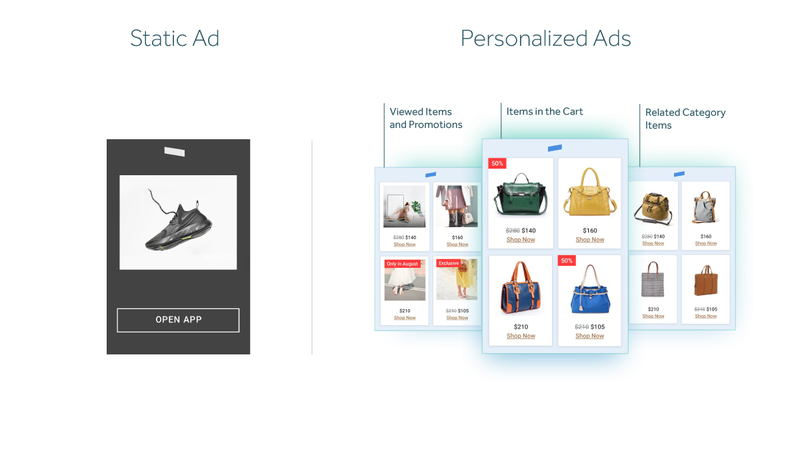 There are more possibilities for personalization in app retargeting in comparison to user acquisition. While generic static ads can be effective for acquiring new users, consider taking advantage of the user behavior data you’ve collected. Target users with a highly relevant, personalized message that will compel them to come back and make a new purchase (or action) within the app. The key to a strong creatives strategy is personalization. To achieve highly personalised static banners you would have to create hundreds of different image files, which is a waste of time and resources. To improve that process, take advantage of dynamic templates. These templates use different assets based on the user profile then automatically combined to serve a real-time, personalized ad. The first step to having a more dynamic creative strategy is by getting really granular. It requires sharing your data event stream with your retargeting partner. You could either share a list of app opens (or another specific event) with your retargeting provider, which limits your personalization capabilities, or you could open your data stream and learn more ways of retargeting distinctively. Each user within the previous purchasers cluster would receive a unique ad. Note that users who receive personalized ads aren’t identifiable (only their device ID is known), and with Remerge, your data is siloed so that your user data is never used to benefit competitors. We only use data for the purposes you’ve intended. An effective creative strategy is not a one-time thing. Sure, there are basic principles of what makes a good ad, but there is no ad bible that points out the best color for the call-to-actions, exactly how much contrast the image should have, and so on. An effective creative strategy is an iterative process; it is an ongoing dialogue which includes a lot of experiments and A/B tests to find out which kind of ad combinations work best with your unique users. As to how often you need to revisit it and taking ad fatigue into consideration, one month is a good timeframe to revisit your ad design. Switch it up, keep it fun! It will pay off. But what about automated builders? Multiple creative template builders are offered in the market which provide full control for prototyping and developing ads. Templates are great, but consider using these as a starting point as opposed to utilizing this as an entire creative strategy, since these do not include the visual design process (such as creating an ad that looks like your app). A strong creative strategy can be achieved by harnessing all of your user data to create truly personalized ads. It is an iterative process which also requires technical skill - to extract and transform the relevant user attributes and to script the dynamic creative rules around those.